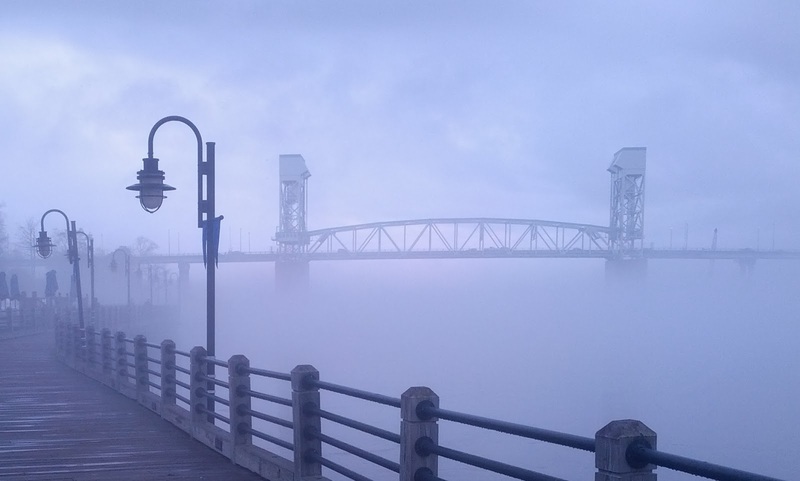 Mog Blog: Wilmington NC waterfront as seldom seen. 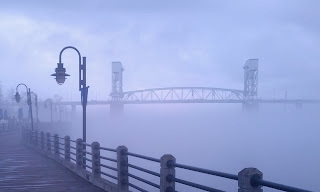 Wilmington NC waterfront as seldom seen. I had planned to test the docking, collect better running videos and some steering around the Cape Fear river. The forecasts for Sunday, January 5th, 2014 were touting warm weather and 6 mph breezes which seemed most reasonable. However, within an hour of the predicted slack of high tide, the 70 degree somewhat cloudy day, went from tranquil to T-rex. The wind was steadily increasing to 13 mph and generated some strange at water gusts. 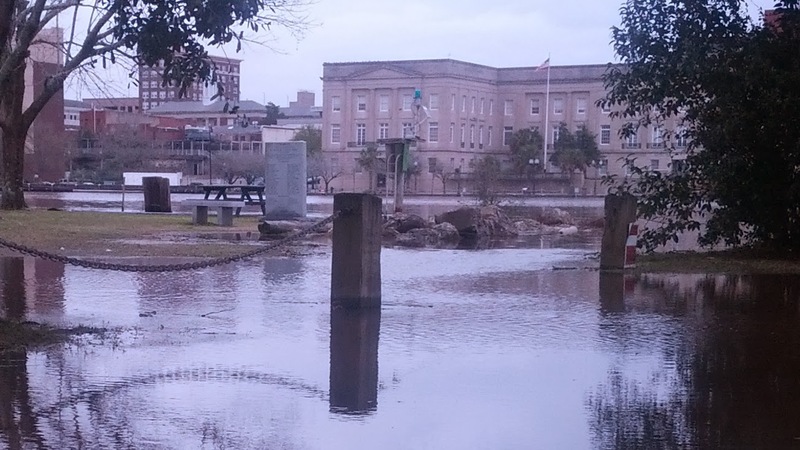 The river continued to pour into its run-on high tide, creating flooding of the Battleship North Carolina Park at the waterfront. Arriving at the Cape Fear Marina and seeing the still rising tide and wind, Hillary and I decided to drive a mile downtown to eat late lunch at the Pilot House restaurant. I figured that would leave time for the tide to abate and maybe the winds drop. For kicks we decided to stop by the battleship and see if there was anything interesting. Water was everywhere that had been walkable and parkable. In fact there was no way for visitors to get to their cars from aboard the battleship without a shin deep soaking. Just like us, they would have to wait to leave the 'slips' in which their cars were parked. I got a few pictures and drove out the park road as water, in several places, rolled across that same thoroughfare. Sitting by the windows in the quaint 19th century Pilot House building and dining on some succulent fried oysters, a Rod Serling scene flowed by our window. 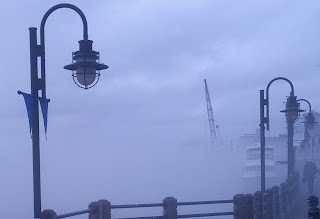 A fog eerily crept down the Cape Fear river from the direction of our marina a mile up river. The city disappeared, the water view disappeared and left only the towers of the drawbridge as indicators of a once-was river. Obviously, this was not to be a good test day but I am quite happy with the pictures, the great lunch, the company, and the views were misty-fying. City of Wilmington on the Cape Fear River... Well, it was there a few minutes ago. One can dingy across from the North Carolina Battleship Park to the Federal Court House. BB-55 occupies a larger parking space. Picture taken with a Samsung Galaxy III, in our Sprinter van on the park's road...in the same water. It is an honor to share the space. MOG Solar Powered Yacht- Tell me more!